I’ve used Kilgore’s Whitebox Character Sheets for a while. They have a great look and have all the necessary info. If you print them double-sided, you get a nice, digest-sized sheet. 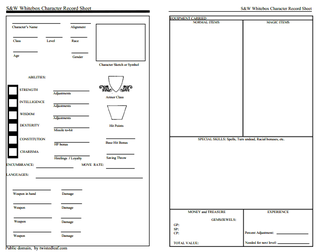 Here is a whitebox character sheet that I made – after a simpler, old-style character sheet, but in the double-sided, digest format. What I do with a single-sided printer is print some copies, flip the printed pages and re-insert them into the feeder, then print again. I can then cut the letter-sized pages vertically down the middle, and the digest-sized pages will be appropriately double-sided.